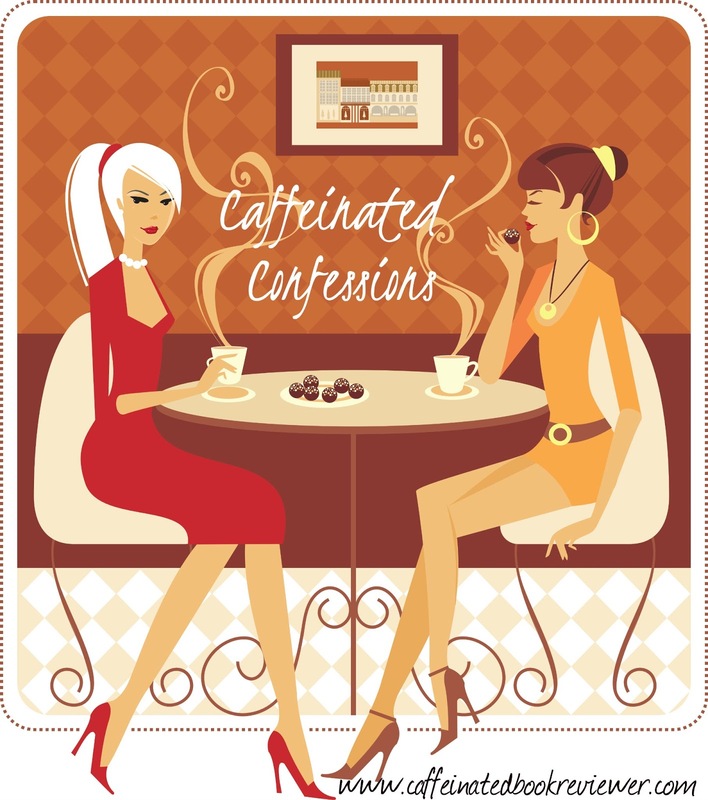 Caffeinated Book Reviewer: Caffeinated Confessions #4 Series, Trilogies and that Last Book Oh My!!! 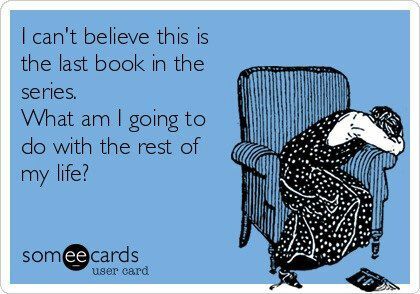 However, that last book and I have a serious love/hate relationship. *nods head and sighs* I cannot wait to read it, I pre-order it and count down the days!!! It's finally in my hands and I am holding the last pieces of the puzzle, the big reveal..woot! woot! and then something happens!!! I avoid it, dance around it, shuffle it to the bottom of my pile. WHY? I think it's because I am not ready to say good-bye. Here is an example: I love Cynthia Hand's Unearthly series from her writing to her characters. I bought each book on the release date and consumed them within days. Except for book three. *eyes bookshelf* I brought it home and it's sitting within view unread. It eyes me hopefully each time I pass, emitting a low siren type song which calls my name. But here's the thing; I know when I pick it up, I will consume it despite my best efforts to savor it. I will love it or hate it, but one thing I know for sure..it will be over and that my friends is why I am avoiding it. I got burned on the last book of my beloved Virgin River series. I consumed it in one sitting only to find out after that it was the last one!! Dang, if it wasn't like my cat died when I found out. There was this big pit in my stomach. I get in the holiday spirit each year with the Virgin River Christmas themed book and I have no idea what book/series will take its place. *wipes tear* When Mira Grant's Newsflesh trilogy ended the only thing that kept me going was news of her Parasite series. My stomach flip-flops every time a Hollows book comes out because I know we are almost at the end. Don't even make me think about the Shatter Me series by Tahereh Mafi coming to an end. I love this series and her lyrical writing style. They are all my babies, my friends and I gave each and everyone of those series/trilogies a part of me! I don't care how big the cliffy is in book two I still dance around that last book because when it's over it's OVER! So yes I get attached and dread endings whether its a book or a favorite TV show. I am telling you now if Doctor Who ends call a medic I may not survive! *seriously* Ok, maybe if you feed me a constant stream of old episodes I will be ok? I cry every time a new doctor is born, especially when David Tennantleft..I swore to hate Matt Smith, but alas I love the geek. Once again I am off course, or maybe not..i form attachments and so that last book, that last story has me doing some kind of ritualistic dance before I can at last open the page and say good-bye. So my question to you is; Do you dive right into the final book? Do you read it slowly to savor it or do you simply read it and move on? Perhaps you are like me and put it off a while, staring at the cover and mentally prepare yourself. As a writer, it's both a relief and nerve-wracking to bring a series/trilogy to an end. If I love, love, LOVE the series, I will procrastinate on reading the last book but for other series, I may delay but I don't hide from it. 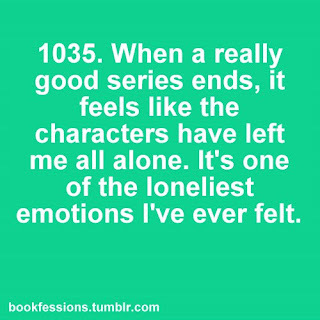 Those series that I love - yeah I hide, pretending that if I don't read it, the series isn't really over. Kim, I look at trilogies and series in totally different ways, in a trilogy I've known from the beginning that there will be an end, plus in a dark fantasy or urban fantasy trilogy the third book lets you breathe easy after two books of heart attacks. In a series it's not often known from the beginning how many books there will be and in the case of Robyn's Virgin River series we didn't know until a little before the last one published that it would be ending. That's like finding out a friend is moving to a distant planet and you'll never see them again. There are some series I want to drag out forever and ever. 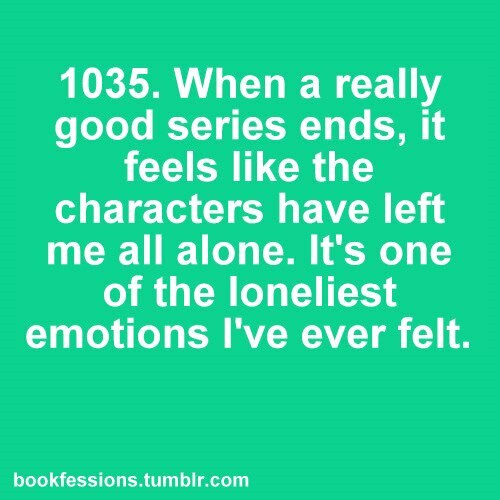 Then there are other that while I love the characters I was happy to see the series end the way it did. Take the Sookie Stackhouse series for instance. I love that series but the last few books weren't my favorites. So when I read Dead Ever After, I felt a sort of happy relief. I completely agree with you! Right now, I have If I Should Die staring at me, begging me to consume it and be done. But i can't. I will hold off for as long as I can before ending a series/trilogy. And when I do, I have my tissues and rebound books ready :) great topic!